Today we can present a big update to you (Furio ver. 0.3.0)! 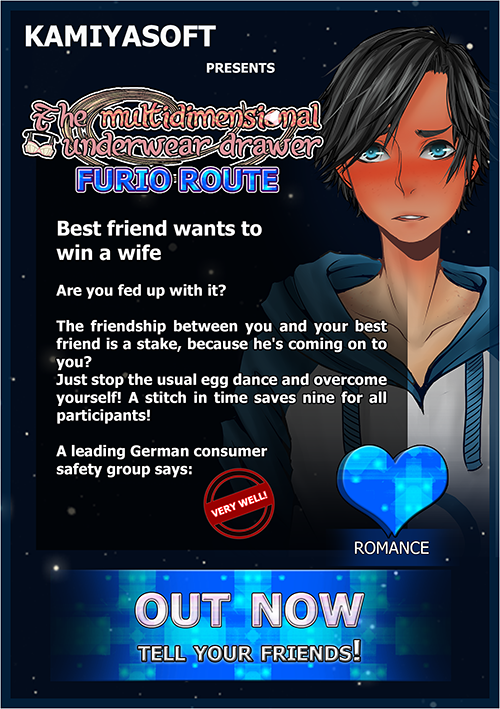 We’re happy to present you the 2nd route: Furio! Finally, Hana can date her willing childhood friend Furio. Sounds like a VN-wise cakewalk? Well, come and take pot luck . Found an error? Please report it at the discussions forum or post a screenshot at the hub. Thank you very much! At this point we want to announce that we have to exchange the release dates of Einar and Blanche because of productional issues. The yuri fans among yourselves have too wait a little longer. We’re so sorry. But the plushy bear friends can look forward to Einar a little earlier. Therefore: Einar is expected to be released in Dezember 2016 and Blanche is expected to be released in February 2017. We started already with the technical implementing of Einar while the dialogues of Blanche will be written parallel. Have fun with Furio! Haven’t played Tymoteusz yet? Take this chance to do this!